This month’s pie is a lovely, simple Shaker Sugar pie. I got the recipe from the Golden Lamb, a restaurant in a nearby town–the oldest continuously operating restaurant in Ohio! And I adore the Golden Lamb for another reason: it’s the first place I met up with Heather Webber. Way back in the day, when we were writing for the same publisher and editor (different publishers and editors than we have now! ), our editor’s assistant mixed up our copy-edited manuscripts–hers went in my envelope, and vice versa. We’ve since joked that the “Ohio” in our addresses must have been confusing. But it turned out that we lived close enough to one another that we had the same thought–why not meet up to swap manuscripts? So we met at the Golden Lamb. Swapped manuscripts. Quickly became friends. And now–sixteen or so years later–are close friends. I count Heather as one of the blessings of my life. We’d still be friends even if we hadn’t remained writers, but thankfully we have. And guess what? 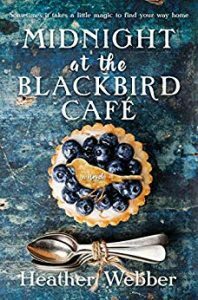 Heather’s newest novel has “pie” in the plot line and on her beautiful cover! It’s a mix of magical realism and women’s fiction and, oh, it is so, so good. I’m lucky to be reading an ARC, but you can pre-order your own copy via her website and learn more about the book, due out July 16! 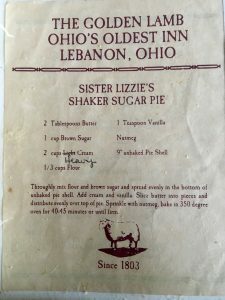 In the meantime, give the Shaker Sugar pie a try, and share it at a potluck or other event. You might make a new friend in the process!